As the acquittal of ousted Egyptian president Hosni Mubarak makes local and international headlines, little attention is being paid to another corner of the country—North Sinai, where the civilian population finds itself caught in the crossfire of a growing conflict. Life in the region is now defined by curfews, checkpoints, house raids and arbitrary arrests. No one is allowed out after dark. Telephone service is intermittent and gas is scarce. The local economy has ground to a halt. Tanks and heavy armor are deployed in the streets, while helicopter gunships clatter overhead. The army has razed hundreds of homes. Ambulances and teachers have been shot at by security forces, while militants have beheaded suspected collaborators. A low-level insurgency brewing in the restive northeastern corner of the peninsula that began to ramp up following the July 2013 ouster of Islamist president Mohamed Morsi has been met with a heavy-handed assault by the Egyptian military, escalating the internecine conflict to unprecedented levels. An attack on an army checkpoint in October killed more than thirty soldiers, the highest death toll among military personnel in recent memory. Sinai’s most active militant group, Ansar Beit al-Maqdis (Supporters of Jerusalem), claimed responsibility in a slick thirty-minute video that included grisly footage of the attack. The group has also publicly pledged allegiance to Islamic State, the militant group that has seized large swaths of Iraq and Syria. President Abdel Fattah al-Sisi responded by declaring a three-month state of emergency in the north and center of Sinai, implementing a strict curfew from 5 pm to 7 am and vastly expanding the jurisdiction of military courts. The army quickly announced plans to create a buffer zone in Rafah, a town bordering the Gaza Strip, to root out militants and eradicate smuggling tunnels across the frontier. With little warning, the military began destroying hundreds of houses, displacing more than a thousand families in a security zone that stretches 500 meters from the border. The decision received the blessing of the United States—for decades the Egyptian military’s prime benefactor—with State Department spokesperson Jen Psaki stressing that Washington is “continuing to support [Egypt’s] efforts to take steps to defend their borders.” Three weeks later, Egyptian officials declared that the size of the buffer zone would be doubled, to one kilometer, essentially covering most of Rafah. The North Sinai governor, Abdel Fattah Harhour, said in late November that all 802 houses in the first 500-meter area have been demolished and that compensation was paid to 290 families. “Even if they were paid millions, these people didn’t want to leave. Who would ever want to leave his home?” Abu Ahmed asks. Many of the displaced have gone to stay with relatives or neighbors in Rafah outside the buffer zone. Others moved to al-Arish, the provincial capital, or as far as Cairo and the Nile Delta. The use of curfews, forced evictions and house demolitions echoed the tactics frequently adopted by the Israeli military against Palestinians in the occupied territories. Meanwhile, Amnesty International criticized the government’s actions as flouting both national and international law. “In their bid to wipe out the threat posed by armed groups in Sinai, Egypt’s authorities have entirely disregarded their duties toward residents in the area,” said Hassiba Hadj Sahraoui, Amnesty International’s deputy director for the Middle East and North Africa, in a statement. 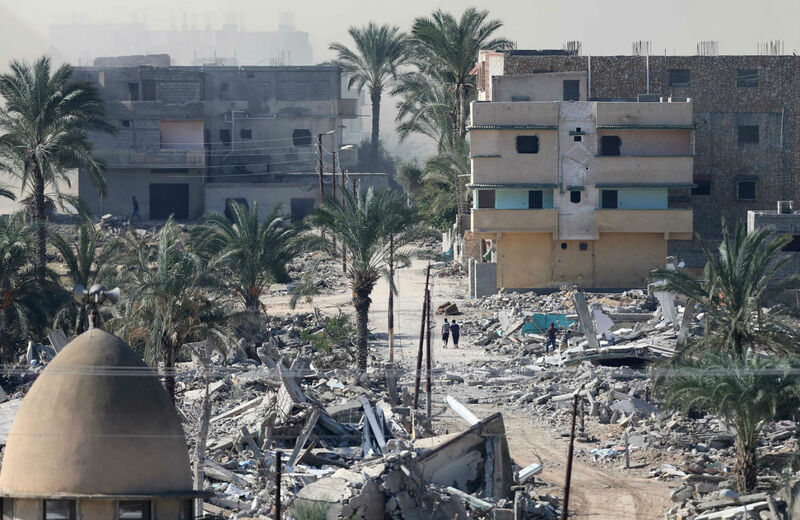 Rafah has indeed been devastated by the military operation. The force of the demolitions has damaged many dwellings in the area. Electricity cuts are frequent, gas stations have been shut down and there is no running water. In late November, ten members of one family, including children, were killed when their home was blown up. Security officials claimed insurgent mortars hit the house, but conflicting accounts pointed to an army air strike. The competing accounts are difficult to verify. Authorities have mostly barred independent journalists from entering North Sinai, though army announcements of operational successes make headline news in state and private media. Over one four-day period, November 20-23, the military claimed it had killed twenty-eight terrorists, arrested eighty-five, and destroyed 246 hideouts, 207 motorcycles and forty-six other vehicles used by militants. Not to be outdone, Ansar Beit al-Maqdis issued a statement on November 30 claiming to have carried out more than ten attacks in the previous month, including blowing up six army and police armored vehicles, killing seven police officers and conscripts and demolishing the house of a man accused of being a spy for the army. Ansar also claimed responsibility for the killing of an American oil worker, publishing pictures of his passport and two identification cards on its official Twitter account. Meanwhile, the toll on civilians across North Sinai goes largely unreported. Interviews with local residents paint a grim picture of life in the region. Many reached by phone were too afraid to talk, even anonymously. Those who did agree to speak refused to give their full names. Daily routine is controlled by the curfew. As the 5 pm deadline approaches, people scramble to get off the streets and return to their houses. “It’s like the last hour before Iftar in Ramadan with everyone rushing home,” says Muhamed, a resident of al-Arish, referring to the sunset meal that breaks the fast during the Muslim holy month. At 5 pm police deployed in the streets begin shooting heavily in the air—the signal that curfew has begun. Anyone outside between then and 7 am risks being shot or arrested and faces up to three months in prison. During daytime hours, while the curfew is lifted, telephone networks are shut down, aggravating simple acts of communication and daily chores. After dark, with the streets cleared, cell phones work once again, but only intermittently. The curfew has severely affected local businesses, with many cafes, restaurants and shops relying on evening customers forced to close. “Those affected by the curfew are not the militants or terrorists; it’s the ordinary citizen—his income, his daily bread, his safety,” Hussein adds. The army and police checkpoints that dot the roads also pose a threat to ordinary citizens. On November 17, army soldiers manning a roadblock near a museum in al-Arish fired warning shots at an approaching busload of schoolteachers just minutes before the 5 pm curfew, according to Ahmed, one of the teachers on board. “They started firing in the air and a bullet hit one teacher in the leg,” he says. The school bus was late reaching its destination because it had been held up for hours at an earlier checkpoint. The next day, teachers at several schools refused to go to work and staged a protest outside the headquarters of the North Sinai provincial government in al-Arish. “We are shot at every day,” says one teacher through tears in an interview at the demonstration broadcast on a local TV channel. She describes an arduous daily journey to and from her school. “There are shots fired, there are explosions, and we feel all of this,” says another teacher. “The children are terrified. Of course this is not a suitable climate for schooling.” Others complained of being stopped and interrogated by militants at roadblocks who suspect them of belonging to the army or police. North Sinai Governor Harhour responded the following day by indefinitely shutting down all schools in the border towns of Sheikh Zuweid and Rafah. Access to medical care after dark is also severely restricted, and sick residents often find themselves stranded in their homes. Locals who need to see a doctor after curfew must call for an ambulance to take them to the hospital. Medical workers first have to coordinate directly with security forces to get permission to go out. “It can take two or three hours, or even until the next morning,” says Dr. Mahmoud Amer, the head of the Ambulance Authority in North Sinai. Ambulances also act as a curfew car service, returning patients home from the hospital, which has increased their workload fourfold. Despite efforts to coordinate their movements, many ambulance drivers have come under fire from army and police at checkpoints, according to Amer. Medical workers have also been detained by militants at roadblocks, who threaten to kill them for any association with the security forces. “The danger to us is from everyone—from the army and police, and from jihadists,” he says. The Sisi government continues to take draconian steps, pouring military resources into the region in an effort to quell the insurgency. Yet it is the residents of North Sinai towns and villages that have borne the brunt of the fighting.